I saw this article saying that Amazon paid $0 in corporate income tax last year. Is this true or just phrased to sound like they are getting away with paying nothing? 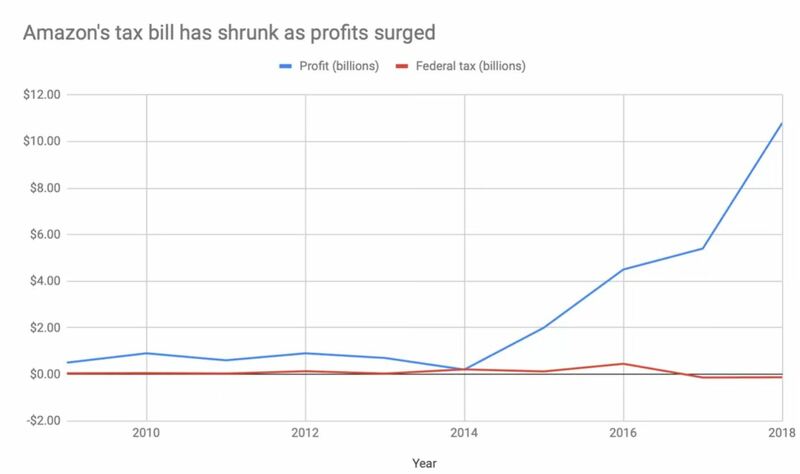 Yet during this surge into profitability — the company’s earnings doubled between 2017 and 2018 — Amazon’s tax bill has actually gone down. The company paid $0 in corporate income tax last year, according to an analysis from the Institute on Taxation and Economic Policy, an astonishing figure that generated dozens of news stories last week. The form they're referring to is the 10-K. Looking at the 2018 filing, it has the same sections, so the same explanation applies. Under "Current Taxes: U.S. Federal" for 2018 it says "$(129)" (parenthesis indicate a negative number and this number is still in millions). In other words, much like last year, they expected to get a federal net tax refund, which is why the line in the graph is negative for those years. Again, this is referring to federal income taxes. There's no evidence that they didn't pay other types of taxes; as you can see in the charts, the columns for "U.S. State" and "International" taxes all show positive numbers. Not the answer you're looking for? Browse other questions tagged united-states economics law taxes business .